For the first time in Ukraine, the Donetsk Oblast has held debates devoted to the problems and prospects of accession of rural areas to cities of oblast significance. Nearly 60 representatives of local self-government bodies from village, settlement and city councils gathered in Mariupol to express the opposite views on the question "Should villages amalgamate with the city?". 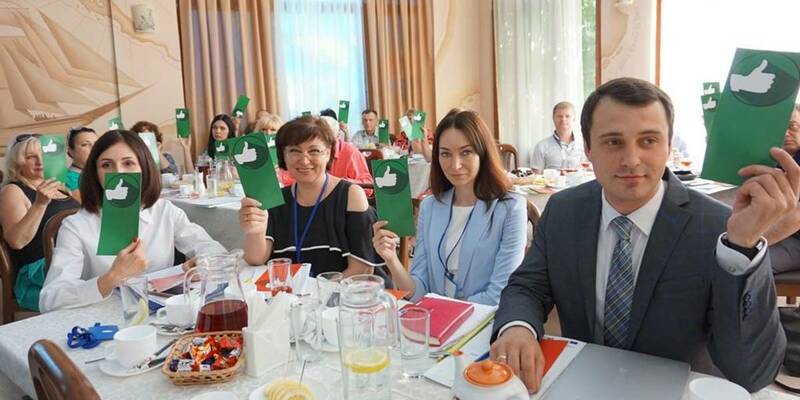 The debates were organised by the Donetsk Local Government Development Centre, established with the support of the U-LEAD with Europe Programme, in cooperation with Donetsk Oblast State Administration. "We invited the brightest speakers to represent both positions," said Artem Vivdych, director of the Donetsk LGDC. “The team "for" accession to the cities of oblast significance engaged representatives of Mariupol, Vuhledar, Lymanska AH. The representatives of the Andriyivska, Zvanivska rural AHs and Novodmitrivka, that is only planning to amalgamate, told about the advantages and difficulties of rural hromadas. " During the debates, everyone present had the opportunity not only to participate in the discussion, but also to vote for or against, while answering questions. The organisers of the debates asked the audience, whether AH establishment would lead to positive changes in the economic development of the city and villages. All the present unanimously answered "yes" to this question. Some opinions differed during the voting on the question "Do you support accession of villages to the city?" – here a certain part of the participants voted “against”. Not everyone believes that in case of accession, infrastructure will improve in villages, as well as in the ability of the village to defend its interests in case of amalgamation with the city. "During the debates, we considered two viewpoints – the prospects of villages’ accession to cities and formation of rural hromadas. Someone heard the opponent’s stance, someone did not change his/her opinion,” said Artem Vivdych. “But the reform continues and gains momentum. The Donetsk LGDC team is ready to proceed with provision of advisory support, invitation of experts on various issues, carrying out calculations of the financial capacity of future hromadas."